Thought it was long past time to write a post. 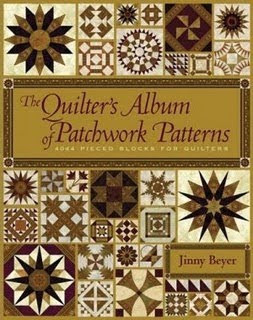 So what have I been doing- well I have to admit it has not been sewing.The mailman did deliver something quilty for me though so my nose has been in this book-I do love the service the Book Depository gives. When I have not been working it has been tidying and packing. I am putting my house on the market as I am moving back to New Zealand in a couple of months. My sewing room has been packed up,although the sewing machine is still sitting there. I now need to get some handwork sorted-my Josephs Coat is very slow in progress so I need to get a few blocks prepared ready to sew. A very good job came up for the midwifery manager of the Southland Maternity Unit and I was encouraged to apply,which I did and have been offered the job. On my trip back for mothers birthday I actually spent more time in the air than on the ground as I flew down to Invercargill for my interview,then back to the middle of the North Island to my mothers party. I am just waiting for the contract to arrive but it should all be ok and if so I will start in the middle of April. The second position I started here in Brisbane is a short term contract that finishes at the end of March and I wanted to honour that which they have been aware of the whole process. Invercargill is right at the southern end of New Zealand and so will be fairly cold and windy but is a lovely small city which will offer a new way of life,and I am looking forward to it. There are two quiltiing shops and four golf courses so I should be fine!! It's a part of the country that is close to skiing, lots of bush walks and coastal areas. I do have friends and a brother and sister in law who live there as well so that is good. It is all a bit of a whirlwind and what makes it worse was that I had started to paint inside my house before this all happened so the paint brush has been working overtime. The great thing about blogging is it doesn't matter where in the world you are as long as there is access to a computer then the friends are there. So if I don't post alot over the next few weeks I will still be here but busy sorting out the transfer. Congratulations on the new job! I don't envy you the packing and moving though! I wish you all the best and yes bloggers are everywhere in it doesn't matter where you are. Wahoo Marls, welcome home, even though you're not quite here yet! You sound really positive about your decision which is great and I wish you all the best with everything needing to be done before then. Congratulations on the new job and the move. It sounds like you will be moving to a very nice area.Hope to hear from you soon. OH I got all excited when you said you were moving back here... till I read more! Invercargill! so far from me! Booo hooo.... I would have loved to meet you. Maybe one day eh? What an awesome job...you must be a very clever girl! CONGRATULATIONS on getting such an awesome position. Congrats! on your successes ... did you have a lovely time for Mother's bday? I am so happy for you - just hope you have time to keep in touch with us all! Congratulations, Marls! And best wishes. Such an exciting time. But I understand it can be tough when everything moves quickly. Glad you will be close to family again. Invercargill sounds like a lovely city. I was on the south island for a week last April, so I have an idea of the area you'll be in. Beautiful! My favorite place was Doubtful Sound. Blessings for a safe trip, success in your new job, and joy in your new life. Please keep us posted as you are able! wahoo, Invercargill huh!! It's not a bad place to be, you must visit Kitznthings if you have not already done so - in Spey St, it is just fabulous. Good luck with your packing! Congrats on the new job! It should be very exciting to move, but I know it takes time and a lot of work! Congrats on the the new job and move! I hope you settle in quickly! Tell us all about it! Cold & windy and 2 quilt shops....sounds like heaven to me! Thanks for visiting Buderim Patchwork Marls, yes that I spy really is something. Brooklyn's quilt is beautiful, love the 3-d aspects, she is a lucky little girl.